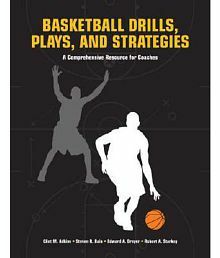 Basketball Drills, Plays and Strategies: A Comprehensive Resource for Coaches@693 Rs [Mrp:-693] - Onlinedeals.discount - A leading product discovery website. Find the true prices of products, read reviews and buy top brand products at reasonable prices. The Only Resource You Need for a Standout Season All basketball coaches can use some fresh ideas for practice drills, game plays and strategies. Whether you are coaching beginners who need a place to start, or a successful team that just needs polish, Basketball Drills, Plays, and Strategies is a resource you can trust to produce positive results on the court. With over 160 drills and plays, this book covers every aspect of your season. It will help you run efficient and effective practices and improve your game in live competition. Step-by-step instructions, accompanied by diagrams and illustrations walk you and your players through every step of the way. Areas of the game that are covered in detail include: * Fundamental skills like dribbling, shooting, passing, and rebounding * Offense and defense * Inbound and tip-off plays * Presses and press breaks * Conditioning drills Because each drill and play includes adjustments to make things easier for beginners and more difficult for advanced players, you will be able to rely on this resource throughout your coaching career no matter what level you are working with. So don’t let time run out-start preparing for your next season today!